People are always asking us if we know about the Fight Club musical. 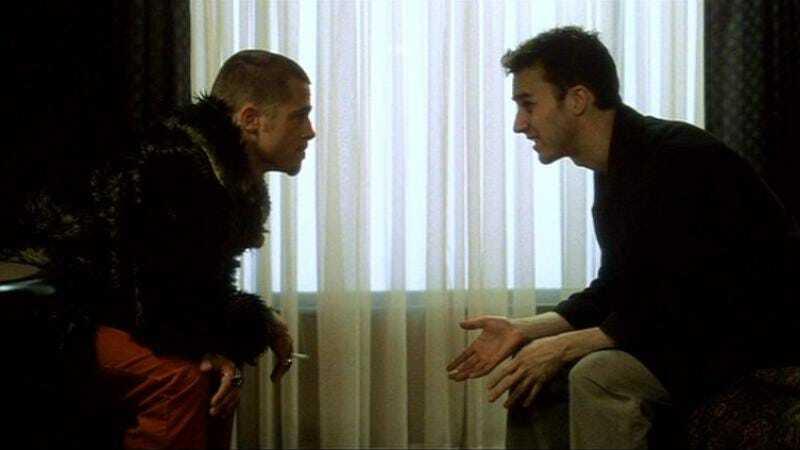 Well, as reported by /Film, Fight Club author Chuck Palahniuk recently tweeted about David Fincher, Julie Taymor, and Trent Reznor working together on a “rock opera” version of Fight Club, something that Fincher has been talking about since at least 2008. Obviously, no such Fight Club musical is actually in the works, because if it were, you would’ve heard about it already, right? You wouldn’t have heard about it from us, though, because we’re not disclosed to bespeak any such information to you, nor would we, even if we had said information you want. Besides, it’s not like there could be countless underground productions of the Fight Club musical popping up all over the country, and everyone knows about it but you. That would be ridiculous. Wink. Sorry, did we say wink? We meant to say “head nod that is not suspicious at all.” Palahniuk also brought up this supposed musical back in April—even though he’s not supposed to talk about it—when speaking with MTV about the Fight Club 2 comic book. We didn’t report on it then because we assumed Palahniuk was testing us to see how tight security is—tight as a drum, of course—but now it seems okay to bring up since we all know he was just kidding. The Fight Club musical isn’t real, it’s just your bad dream. Or maybe you’re its bad dream? Maybe you and the Fight Club musical are actually the same person? Whatever is really going here, you don’t have to worry about it. We’ve got this whole Fight Club musical thing under control, sir.